By far, severe headaches and mood swings can be considered two of the most debilitating symptoms of menopause. When experienced individually, they can be a pain, but when suffered together, they can certainly affect one's quality of life. There are over 300 types of headaches, with only 10 percent of them having a known cause. Some of the main types of headaches are tension, cluster, or sinus headaches in addition to migraines. While each has its own list of causes and triggers, for menopausal women, the appearance of headaches is commonly due to hormonal fluctuations of estrogen and progesterone affecting the constriction and dilation of blood vessels, resulting in headaches. Characterized as drastic changes in emotional state from periods of euphoria to depression, mood swings can seem to occur for inexplicable reasons. 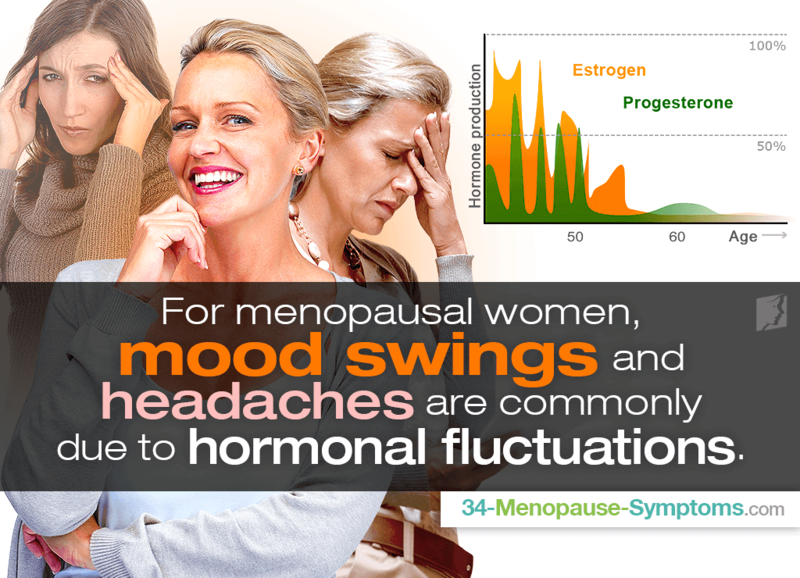 Mood swings resulting from menopause are instigated by lowered levels of estrogen. Because estrogen directly affects serotonin levels, which regulate a person's mood, estrogen's erratic fluctuations as fertile years come to an end have a negative effect on temper and attitude. What Else Can Provoke Headaches and Mood Swings? In addition to the hormone fluctuations during menopause, there are other factors that can increase a woman's chance of experiencing them. For example, other symptoms of menopause, like hot flashes or night sweats, can disturb sleep, and thus cause fatigue. This extreme tiredness can translate into increased stress levels, subsequently provoking migraines and mood swings. How Can I Treat My Headaches and Mood Swings? Treating menopause symptoms once and for all involves fixing the root cause of hormonal imbalance. Therefore, it is crucial to equilibrate hormone levels to help lessen the intensity and occurrence of severe headaches and mood swings. Click on the following link to find out necessary information about natural and effective menopause symptom treatments so that you can finally live a hormonally-balanced life free of bothersome aches, pains, and disturbances.